This is the fourth and final blog post in a series in which we’ll be looking at the trade show process through the client’s eyes, as we get ready for ExhibitorLive 2017. Aside from that, there are two main benefits to pre-assembly. Maybe more than any other subset of the marketing industry, the trade show business is built on trust. Clients tell us their goals, give us some direction, and trust us to build exhibits that meet their needs. 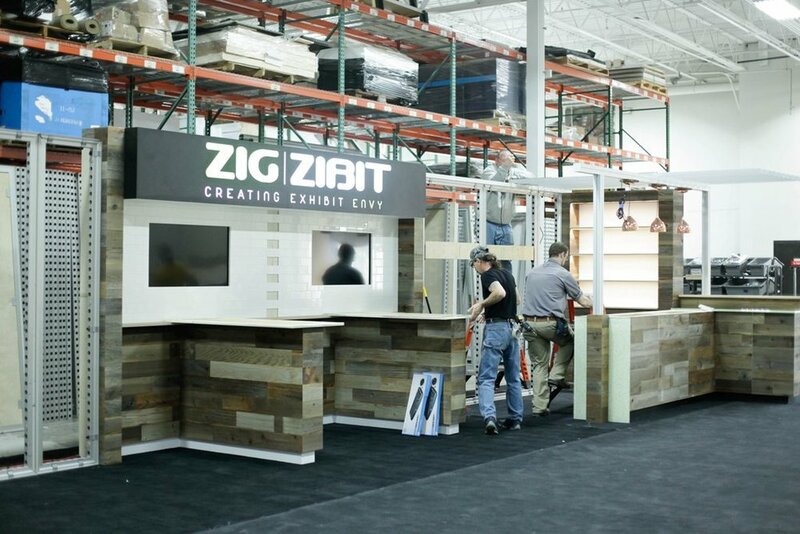 But trade show managers do have a chance to get a preview of their booths when we pre-assemble the booth at our shop. This is especially important with large, custom booths that are being assembled for the first time. This preview gives trade show managers a chance to become comfortable with the exhibit, to see the story it will tell, and how it will accomplish their goals. That comfort level is also helpful when they talk with their bosses and train the booth workers. And, of course, it gives them a chance to notice any potential catastrophes. This is not likely, since we take great care to keep our clients updated, but if there is anything that needs to be changed, we can address it at that time. Trade shows are a complicated business, especially when you consider all of the differences at each convention center. They all have different rules governing labor and who can be used to put booths together. That makes it especially important for our field crew to be familiar with how the booth should come together. With the uncertainty of the capabilities of the convention center’s assembly crew, our crews need to know where ever screw goes, where every wire gets connected, where every graphic should hang. Once the booth has been assembled and all of the potential issues are addressed, it gets disassembled and packed into vertical crates. Why vertical crates? Many other companies use horizontal crates. There’s a good reason for it: it helps speed up the assembly and disassembly process. With horizontal crates, components are packed on top of one another. But our vertical crates are jigged to allow components to slide in. This makes it easy to identify and unpack the components we need -- in the order we need them -- rather than unpacking entire crates and having everything strewn about the convention center floor. It also helps protect components from potential damage during shipping. That’s it! We’re done. As you read this, our booth is likely making its way across the country to Las Vegas. We’ll meet it there and begin setting it up. More importantly, we hope we can meet you there, too. We invite you to see the final product of all the work we’ve been doing, and let us know what you think. Just drop by booth #958 or contact us to make an appointment. Pre-assembly lets you see the exhibit and get comfortable with it before the show starts. Convention centers all have different labor rules, and pre-assembly helps mitigate any difficulties that may cause. Come see us at ExhibitorLive 2017, booth #958!